SEOUL, South Korea (CNN) -- North Korea is "badly miscalculating" if it thinks its diplomatic bluster and maneuvering can "drive a wedge" between the United States and South Korea, Secretary of State Hillary Clinton said Friday. 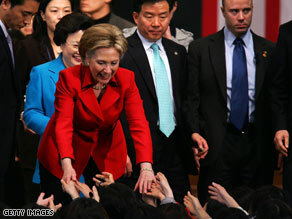 Secretary of State Hillary Clinton shakes hands with students Friday at a university in Seoul, South Korea. "Our alliance is stronger than ever," Clinton told CNN's Jill Dougherty in an interview. "And it's not only about our mutual security, but it's also about how we're going to deal with the global economy and so much else." North Korea's nuclear program has been the pressing crisis in the region, and Clinton's visit to Asia comes at a time of escalating tensions on the Korean Peninsula. North Korea said Thursday it was ready for an "all-out confrontation" with South Korea, which it accused of kicking up war hysteria. There have been unconfirmed indications that North Korea was gearing up for a launch of a long-range missile. Clinton said North Korea's swings from being bellicose toward its neighbors to behaving rationally and sticking with commitments are a matter of calculated diplomatic maneuvering. "I think the past history proves that North Korea can be either of those, depending on what it's attempting to achieve," said Clinton, who has since arrived in China after leaving South Korea. "And what's clear from the six-party process over the years is that when North Korea decides to cooperate and make agreements that it believes are in furtherance of its own interests it will do so. And when it doesn't, it is always seeking advantage and it uses provocative words and threatened actions to try to get attention in order to make a deal in some way -- food and fuel and other kinds of assets." North Korea is testing the new U.S. administration to see how diplomacy can move forward, she said. "I think you have to respond in kind as you look at the behavior of the day, the week, the month, the year," Clinton said. "We're hoping that North Korea will see its way clear to re-engage, and as I've said repeatedly, if we can get to the point that their denuclearization is verifiable and complete, a tremendous advantage is waiting for North Korea, not only for a bilateral, normal relationship with the United States, but I think a lot of international support and aid that could come to the people of North Korea." North Korean leader Kim Jong-Il reportedly had a stroke, and some observers have said he may not be fully in charge of the country. "If there is a succession, even if it is a peaceful succession, then that creates more uncertainty," she said. "It may also encourage even more provocative action as a way to delegate power." Clinton acknowledged that such open discussion of potential succession in another country is unusual, but she said "candid conversation" is necessary and appropriate. "That's on people's minds, it's written about," she said. "We ought to be engaging. We ought to elicit reactions and opinions about that and many other issues." She said she is reflecting the Obama administration's vision for diplomacy. "I also am very deliberately talking about things and trying to open up dialogue and create some space for there to be some sensible discussion about the way forward and some very difficult problems."